SCUBA use one of my images for the front cover of the the March 2012 magazine. 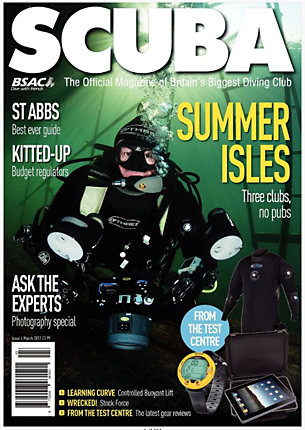 SCUBA have used one of my images for the front cover of the the March 2012 magazine. Thanks go to one of my regular dive buddies, Rob Bailey, who probably never thought a cold winter dive on a Saturday morning at Stoney Cove with me, would result in his face gracing the front cover.